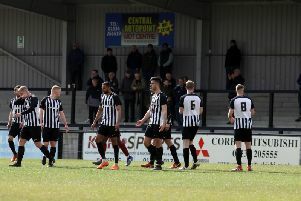 Gary Mills believes a break from the struggles of their Evo-Stik Northern Premier League Premier Division campaign will be no bad thing for Corby Town this weekend. The Steelmen take on league rivals Stafford Rangers in the first qualifying round of the Buildbase FA Trophy at Steel Park tomorrow (Saturday). The confirmation of Mills’ appointment last Wednesday night seemed to have the desired effect on the Corby squad as they claimed a crucial 2-0 victory over Frickley Athletic thanks to goals from Shaquille Whittingham and Andre Johnson. But the first official game in charge for Mills and assistant David Bell last weekend ended in a 2-0 home loss to Nantwich Town, which left the Steelmen five points adrift of safety in the table. However, they can put their battle to avoid a second successive relegation to one side for this weekend. And Mills, who is a former FA Trophy winner, is keen to ensure his team turn in a better display than the one they served up in his first game at the helm. “I don’t think it’s a bad thing for us to have a break from the league,” the Corby boss said. “It’s a chance to progress in a knockout competition. “I have been lucky enough to win the FA Trophy at Wembley, it’s a great competition if you can get on a good run and that’s what we will be aiming to do. “But the most important thing for me is to get the players 100 per cent at it. Bell, meanwhile, is in line to make his debut for Corby tomorrow. Mills confirmed his assistant will be registered in time for the Trophy clash. He said: “David will be registered in time for the game, which is huge for us.